Last month the annual Eagles’ Den business idea pitch competition was held in the Richmond campus conference centre. The competition pits Kwantlen Polytechnic University students against one another in a bid to present their business ideas to a judge’s panel, all in the hopes of being awarded a bit of funding for their startup venture. The panel was comprised of a few Vancouver-based business owners and representatives, and the event was put together and hosted by members of Enactus KPU. The awards were to be given out to the top three presenters in the competition, but due to low attendance there were only three competitors in total. This meant that everyone who entered the competition ended up going home with an award. 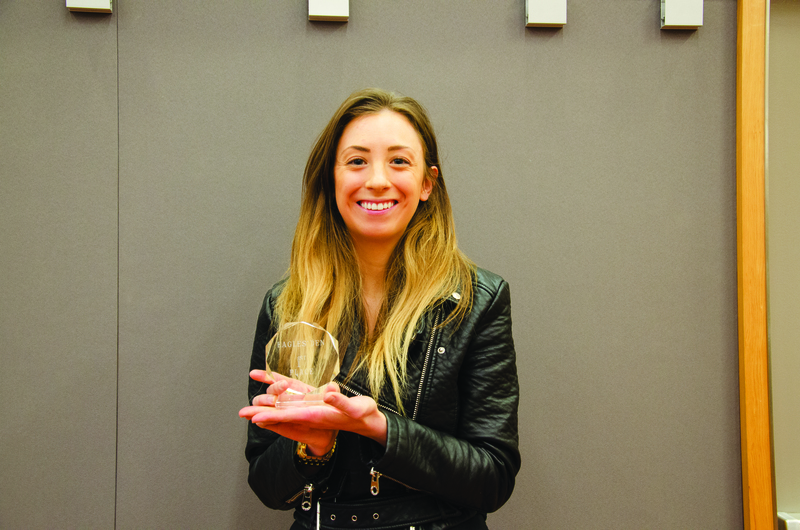 Kathleen McCullogh, a first-year student in KPU’s Fashion Marketing program, received the first-place prize of one thousand dollars in startup funding, as well as a VIP pass to audition for CBC’s Dragon’s Den. McCullogh’s winning product was ethically sourced slippers, meant “to raise awareness of eating disorders through pop-up breakfast clubs. The premise is to serve breakfast around a table, and people come in pajamas and slippers,” she explains. Judges Yukiko Nagashima and Laura Lalonde, both representatives from Coast Capital Savings, explained why they decided to get involved in the competition. “I wanted to get an idea of what young people are thinking these days in terms of innovative ideas that impact social environmental or economic things within the community or on a global scale,” says Nagashima. “A lot of the people I deal with are people who work for startup companies, so I was interested to hear these ideas at the very early stages of their development, rather than just seeing where those ideas end up,” says Lalonde.